Azam Khan seeking UN intervention on to make India Hindu nation. The minister of Uttar Pradesh and Samajwadi party leader, Mohammad Azam Khan, has attacked by his statement on the BJP and the centre. The Minister has written a letter to the UN secretary general BAN KI-MOON. In the content of letter he accused the RSS that the followers of it were hatching conspiracy to massacre the Muslims in India. 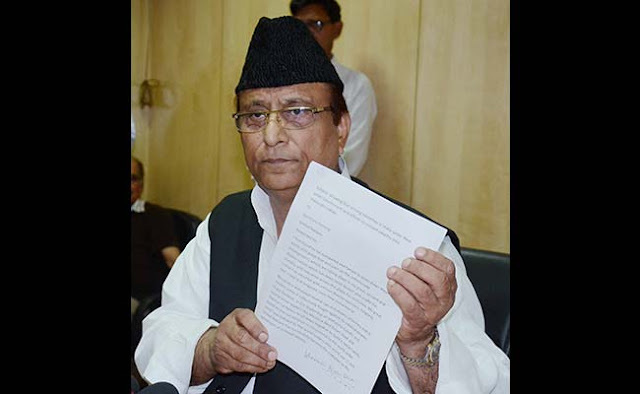 Azam Khan has claimed that he was awakened by the reports printed in the news papers. He said in the letter that the RSS cadre failed in its plan because the media was chasing the issue. He claimed that he was awaken through the reports on print media. He said in the letter that, because the media was chasing the issue, the RSS cadre failed in its plan. He said seeking the UN intervention that there is plan to make India a Hindu nation. Azam has cited even the election of Bihar in the letter. He has written that, the agenda changing of Bihar election, the issues have arrived now on the beef. There is no talk on development. Can anybody be killed just for the purpose that he has mere the allegation of killing the cow? Even nobody tried to oppose justice Katju. Azam appealed the PM, "The people who spread the communalism and the violence pacify them please." He said that the five stars hotels where the beef is served must be extirpate like Babri Mosque. The BJP today lashed out at Uttar Pradesh Minister for writing to the UN on"communal incidents" in the state. Bharatiya Janata Party's state spokesman Vijay Bahadur Pathak told reporters in the state capital that it would have been "prudent" that the minister first spoke on the issue to Chief Minister Akhilesh Yadav before taking it to international fora. He said maintenance of law and order was a state subject and that Chief Minister Akhilesh Yadav and his Samajwadi Party should explain why such an incident took place. He said prohibitory orders were being violated in Dadri village where a mob lynched a Muslim man over rumours of eating beef. The BJP spokesman said that in Muzaffaranagar in 2013, police had failed to act on time, and when they acted the action was biased, which led to violence that left 63 people dead and thousands displaced.